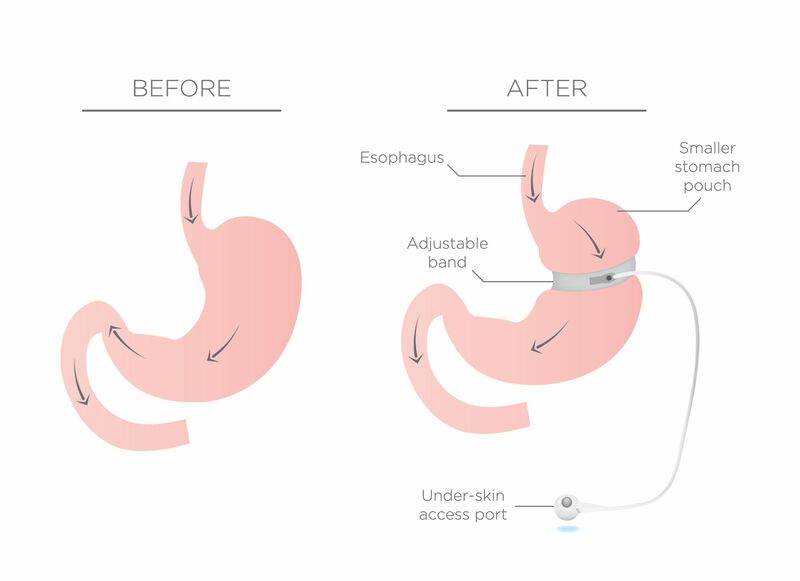 LAP-Band® is a restrictive form of bariatric surgery. Unlike other types of weight loss procedures, the full LAP-Band® recovery is relatively quick. When factoring in weight loss into the recovery timeline, however, the process is lengthy and is often comprised of numerous emotional ups and downs. If you are considering the LAP-Band® method, Dr. Liza María Pompa González at LIMARP in Tijuana, Mexico, serving San Diego, CA and surrounding areas, will explain in detail what you can expect during your recovery. The LAP-Band® procedure is performed laparoscopically. This means only a few small incisions are needed to insert and place the band and the access port. You may need an overnight stay at our bariatric center. During this time, you may feel some discomfort, although we will provide you with pain medications. You must stick to ice chips and small sips of water for a few hours after surgery. Although you should limit your overall activities, walking is usually recommended by the second day of your recovery. Once we release you from our bariatric center, we will transport you back to your hotel room where you can rest. We will provide you with detailed instructions regarding what you can and cannot eat for the duration of your recovery. In about five days, you will return for the removal of any stitches and for a general follow-up visit. Dr. Pompa González will evaluate your healing progress. Thanks to the minimally invasive nature of the LAP-Band® procedure, most patients can return home and go back to work within a week. You will, however, need to avoid heavy lifting and strenuous exercise for several more weeks. Your activity levels are still restricted during this time. Continue light activities such as walking to promote blood circulation. The biggest restrictions during the first several weeks are with your diet. For two to four weeks, you will be limited to a liquid-only diet. Most patients can move on to semi-solid foods, such as pureed soups and smoothies by week four. After about six weeks, you can begin incorporating solid foods back into your diet. You should begin to establish a normal exercise routine at this time. Some patients need their LAP-Band® adjusted after about six weeks. Most bariatric patients must adhere to strict diets, even after recovery to ensure they are getting the proper nutrients. Dr. Pompa González offers a full nutritional program that can help you after surgery. You will not magically shed hundreds of pounds immediately after surgery. As with other weight loss methods, you will only lose a few pounds each week with the LAP-Band® system. Dr. Pompa González can help you set realistic expectations for your post-surgical weight loss so you do not feel disappointed. If you are interested in bariatric surgery from one of the world’s top weight loss centers, contact our office today to schedule a consultation.